Earlier this week EV News had the opportunity to test drive a Tesla Model S P85+ around the streets of Sydney. It was only a very brief experience compared to the week long test drives we've had with most other EVs, but it was long enough to confirm that Tesla Motors make electric vehicles that are in a league of their own. The first thing you notice about the Model S is that it's a big car. All dimensions including wheelbase and track are larger than a full-size car like the Holden Commodore VF. The wheelbase seems governed by the size of the floor mounted flat-pack battery enclosure which makes up 700 kg of the vehicles 2,100 kg kerb weight. The upshot of this being the Model S has more interior storage space (1,796 L) than the Mitsubishi Outlander PHEV SUV we tested a few weeks ago. For such a heavy car the weight wasn't noticeable while driving, although I am familiar with driving full sized cars and the test route didn't allow for any high speed loaded cornering. In acceleration the P85 Model S is stunning! Unlike all other EVs I've driven which have synchronous BLDC permanent magnet motors, the asynchronous AC induction motor in the Model S really gives a kick in the back off the line. So much so I'm thinking perhaps Elon Musk should consider issuing Tesla reps with neck braces for test drives. The BMW i3 I drove in Munich earlier this year was, up until this week, the fastest EV I had driven. I noticed from a standing start, full off the line acceleration in the i3 didn't really come on strong until over approx 25 km/h, on it's way to 100 km/h in 7 seconds. With 310 kw and 600 Nm peak torque from zero RPM, the 3 phase AC induction motor launches the P85 Model S from a standing start to 100 km/h in just 4 seconds. That's faster than your average Porsche. As with all EVs, mid-speed acceleration was also impressive but with the Tesla, mind blowingly so! One of the reasons I've been so keen to sample a Model S is because on paper it is the only EV broadly comparable to my current daily driver, which has 255 Kw / 475 Nm with a 1600 kg chassis. The 5.7 Lt 4 door sedan does 0-100 km/h in around 5 sec which is faster than both a standard 85 (5.6s) and the 60 version (6.2s) Model S. I've clocked up a few hundred thousand kilometres in this car so am very familiar with it's above-average acceleration, yet the Model S P85 absolutely kills it! Ever since the Tesla test drive I've been trying to get my head around how the Model S P85's mid-speed acceleration could feel twice as fast as my ICE car. Multiplying the Tesla's 600 Nm peak torque by the 9.73:1 reduction gear ratio gives 5,898 Nm at the rear wheels. Divide that by the 2,100 kg kerb weight and the Model S has 2.8 Nm /kg. Running the same numbers for my Corvette engined family sedan gives 4,476 Nm (in first gear only). Divided by 1,600 kg kerb weigh surprisingly results in the same 2.8 Nm/kg figure (not accounting for transmission losses). So why does the P85 feel twice as fast at mid speed? The 3 phase AC, copper rotor, induction motor's torque curve gives a flat 600 Nm between 0 and 5,000 rpm. As with all EVs this broad torque curve allows the Tesla to have a single speed transmission. With the gear ratios commonly used in EVs, they're effectively in the equivalent of first gear all the time. So while my ICE powered car has approx the same torque to weigh ratio in first gear, the V8 engine doesn't reach peak torque until 4,000 rpm (which accounts for the extra second 0-100) and rear wheel torque reduces with every up-shift of the gearbox until top gear where maximum torque is down to 'only' 1,000 Nm. 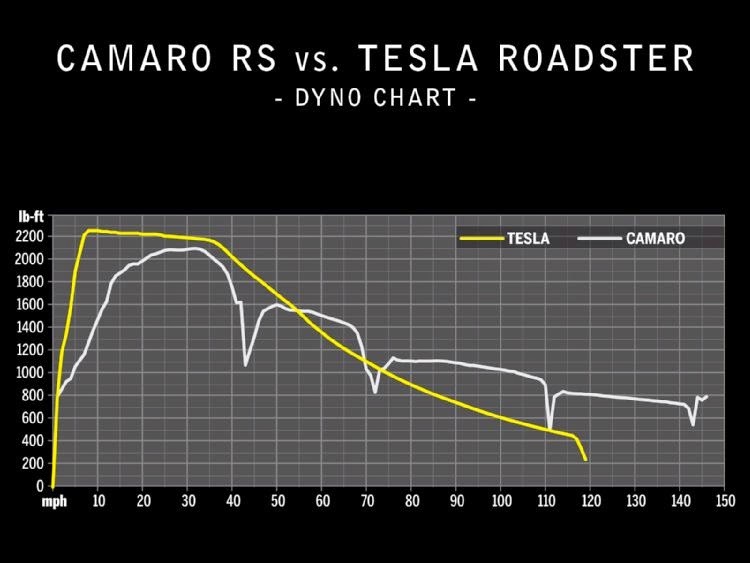 By comparison, the Tesla has approx 6,000 Nm available on-demand from standstill up to 70 km/h. Above this speed the electric motors torque starts to decrease but at 120 km/h the Model S P85 still has 3,405 Nm at the wheels. The bottom line is, from a standing start the Tesla has full torque almost immediately (see dyno chart below) and at mid-speeds, due to the advantage of a permanent low gear ratio, the Tesla has up to 6x more peak torque available at the flick of the throttle pedal compared to my reasonably powerful internal combustion engine equipped car. There's no waiting for auto gearbox kick-down, or engine rpm to increase, the Model S just delivers immediate peak torque at any speed. The results are... absolutely devastating acceleration at all speeds and an almost permanent 'Tesla grin'. When a start-up company like Tesla Motors can execute a new luxury car with such startling performance, 500 km range and running costs that are 1/10 th that of equivalent ICE cars, It's no surprise that Mercedes, Audi and BMW are already working on their own versions of the Model S. I don't think it's much of an exaggeration to say this car is revolutionary! The Model S P85+ as driven was priced around $190k. A basic P85 option package with the full 310 kw / 600 Nm and 21" wheels is $130,600. Unfortunately luxury tax and other government charges add another $25k bringing the total cost to $155k in Australia.